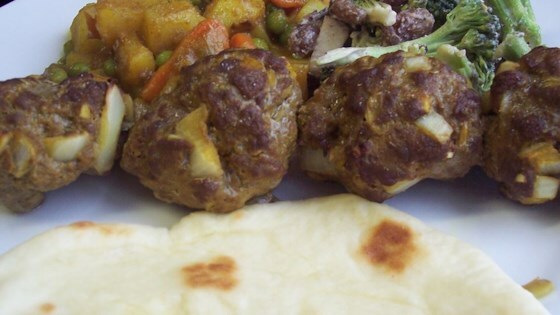 "Tasty, spicy Indian-style ground lamb kebabs. Excellent served over basmati rice." Preheat the oven's broiler and set the oven rack about 6 inches from the heat source. Lightly grease a broiling pan. Mix together the lamb, garlic, chili peppers, onion, coriander, yogurt, turmeric, lemon juice, and salt with your hands until well mixed. Roll the mixture into 15 meatballs. Thread 3 meatballs onto each skewer, separating with chunks of red bell pepper. Place onto the prepared broiling pan. Broil for 5 minutes, then turn the skewers over, and continue broiling until no longer pink in the center, about 5 minutes more. A perfect combination of sausage and vegetables baked together until piping hot!